I really enjoy this ritual of meeting up with friends and colleagues; the mood laced with anticipation before the cycling begins. David Hall from Skedaddle was waiting to meet us at Pisa airport. He introduced to his Skedaddle colleagues Naomi Lindfield, Giuseppe de Maria & Olly Townsend, plus our friend and veteran of 5 of these trips, Isobel Riley. Of course the best part of the week is getting out on the bikes and cycling as a group. Luckily there was never too great a distance between front and rear riders – a great way to soak up the sights and catch upon the past few months! I always find you learn a lot about characters when riding together – you don’t need to prove anything here, just simply enjoy the social element of the ride. Skedaddle picnics have always been a big highlight of our weeks away, and our holiday in Tuscany didn’t disappoint. Our guide David is a total pro at selecting the best locations by the road, always with that tell tale ingredient: an amazing view. Our lunches all made the most of the incredible local delicacies and a particular highlight included the fresh mozzarella salads. 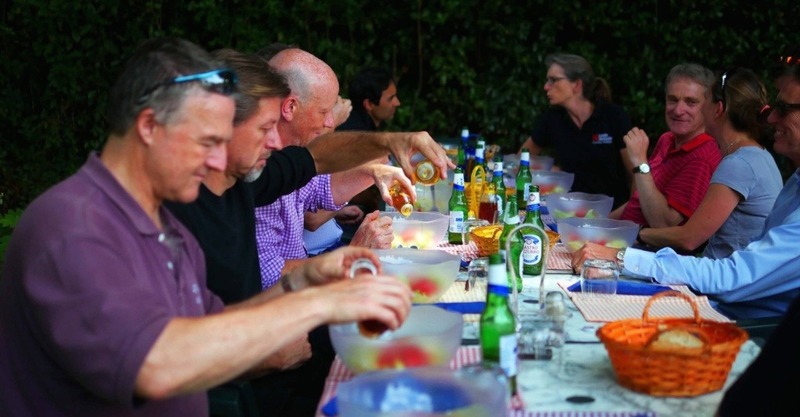 Alongside our tasty lunches came the well-earned evening meals featuring some of the best food we’d ever experienced in our 7 years doing these cycling adventures. One evening I enjoyed a duck liver terrine with sun dried tomatoes, then carbonara (with raw egg yolk), followed by fillet steak topped with foie gras and shaved white truffle – bellissimo! The highlight of the week was our visit to the Nostra Vita vineyard, meeting the lovely but slightly eccentric owner, Annibale Parisi, who lovingly cares for 7 acres, of which 2 vines producing just 10,000 bottles of high grade wine pa. Planted in 2000, his first sales were 13 years later in 2013 (sounds like biotech!). The tour of the estate included the wine production and ageing in oak barrels. Annibale’s attention to detail included hand painting each label for his top of the range Brunello. We tasted his 2008 & 2009 Brunello plus 2012 Rosso in a magical setting high up on the hillside, looking down over the valley. As my first experience of Tuscany, I couldn’t help but be impressed by the amazing scenery, rolling hills, cypress and olive trees and vines, but also wild grassy fields. I hadn’t appreciated this was such an expansive area made even better by exploring on two wheels. One of the key features we would revisit on our bikes would be the ‘strade bianche’ which translates as ‘white road’. Made of loose dirt and gravel, amazingly this is raced on by the professionals, and one particular stretch we cycled covers part of the one-day event L’Eroica. 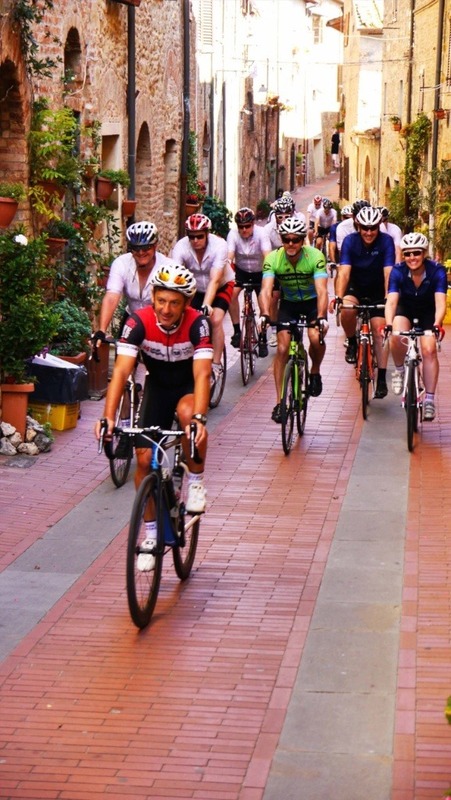 As we explored smoother terrain, the pace quickened, including sweeping descents, and classic Tuscan fields leading up to magnificent villas perched on hilltops. 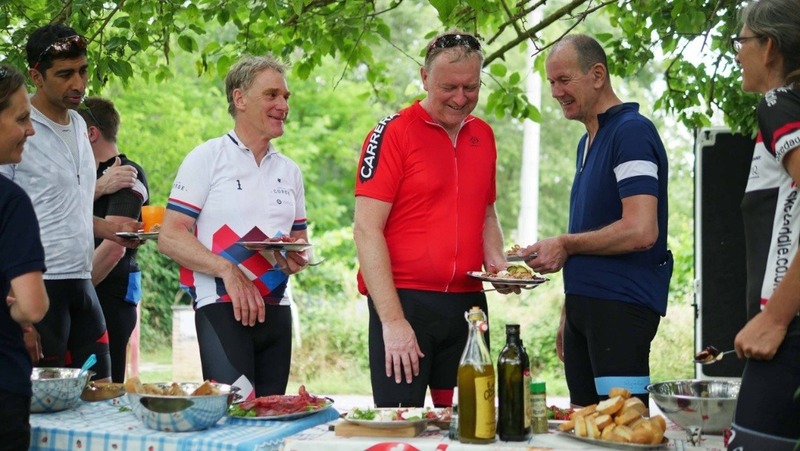 Russ Cummings enjoyed a specially adapted version of our road cycling holiday Tuscany Tourer. For more information about this holiday click here. Fancy taking on your own Tailor Made holiday? Click here to find out how.